Although I have always had an interest in cooking, my kitchen experience before marriage was limited to helping mom with a little chopping or stirring and since me and Manoj were moving to Hyderabad after the wedding one of my major concerns was managing a kitchen all by myself. And you know how as a new bride you want to impress everyone, and your culinary skills are such a major judging factor especially with elders in the family. Little did I know that my worries were so needless. I cannot thank God enough for a hubby who is not at all fussy about food (but is as crazy about it as me) and is so patient and supportive of my endless experiments in the kitchen. We have lots of fun trying out new cuisines but our favourites still remain simple home made dishes. Soak the tamarind in some warm water. Squeeze and extract the pulp to get a thick paste and discard the seeds. In the meantime pressure cook the tomatoes adding 1cup water, salt and turmeric powder for 2 whistles. Open the cooker after the pressure is completely released. Mash the tomatoes well, you can remove the skin if you want to, I like to leave it in. Add 4cups water, tamarind paste, pepper powder, rasam powder, jaggery, curry leaves and salt. Bring to a boil and simmer for 5mins. Remove from heat and stir in the coriander leaves. For the tempering, heat oil and cumin and mustard seeds, when they splutter add the rest of the ingredients and fry till fragrant (do not brown the garlic). Pour over the rasam. Boil the potatoes and cut into small cubes. Heat oil and add cumin seeds. When they splutter add the potatoes, green chillies, turmeric and salt and toss to mix well. Fry till the potatoes brown a bit, for 3-5mins. Mix in the chopped coriander leaves and serve hot with rice. 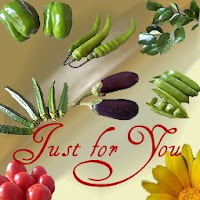 Sending this to Alka's event "Just for You". Yum Rasam! Just the thing for cold evenings!! Rasam n potato fry goes awesome together..lovely combo..
Thnks for sending in my two fav. in the event. this is one of my favorite combos! that is such a great combination..i think i now know what to make for lunch :) and i have something for you in my blog..come and grab it..
Hey the rasam looks delicious. It's one of my fave South Indian things to have. I like the tamarind rasam. Must try your version of it! looks so good, rice, rassam, papads and potatoe fry! Potatoe fry is one of my favorite combination for rassam ( with a handful of fried prawns with it , Mmmm, I'd finish a plate full in minutes! This is a winning combination - unbeatable indeed and both look perfect Poornima. poornimastastytreats.blogspot.com is very informative. The article is very professionally written. I enjoy reading poornimastastytreats.blogspot.com every day.